Identifying user accounts that are no longer in use, is an important security issue in an organization of any size. The script presented on this page will list all user accounts that have not been logged on with within a configurable number of days. The content of this page is available as a video tutorial at the bottom of this page. 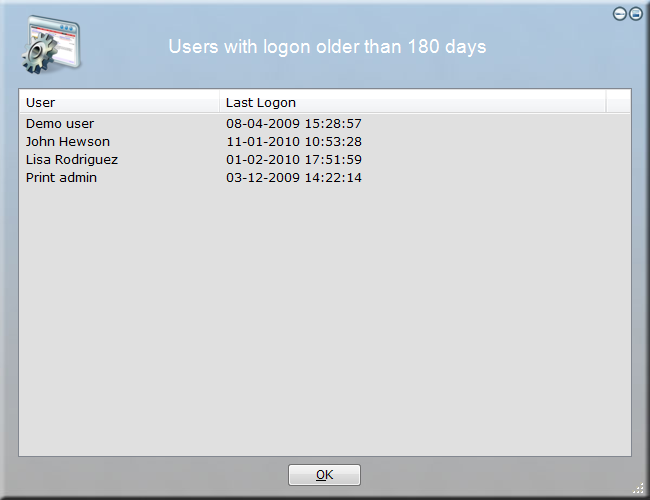 A slightly modified version of the script is also presented, which shows computer accounts that no user has logged on to within the configured number of days. The script presented here to solve this problem is a custom application. A custom application is a script that is compiled into an exe file. 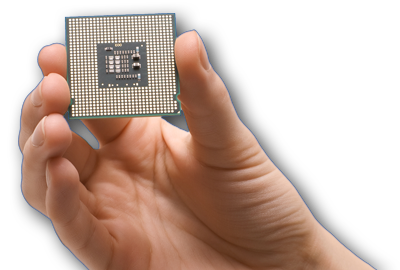 Please refer to this page for more information on custom applications. The compilation from a script to an application is not a must; the script can be used without compilation. In this example, it is pretty obvious that the "Print admin" account is a temporary account that has not been used for years. The "Demo user" account also looks suspicious. The others two accounts could be users that are no longer employed in the company. These will require further investigation to determine, if these can be deleted or disabled. You could compile an exe file for the Human Resource department to list all user candidates that might be obsolete. With an extra UserIsAdmin condition, you could build a version for yourself that lists only domain admins, who have not logged on for a much shorter period of time. You may only want to investigate a subset of users. The example script below looks at all users. To have it look at users only in a specific Organizational Unit, the collection AllUsers could simply be replaced by the UsersInOU collection. You could build additional logic to further filter the users listed, for instance based on other Active Directory attributes and properties. You need a different report. For example using a "Not UserHasPasswordExpiry" condition instead of extracting logon date will show you a list of users that do not have password expiry instead. The script listed is available directly in the script editor: Go to the "Documentation" tab, select "Obsolete User Accounts Report" under the "Insert Example Script" submenu. When the script is visible in the editor, simply press F5 to execute it. The "ThresholdDays" setting is the threshold in number of days of when accounts are included in the list. 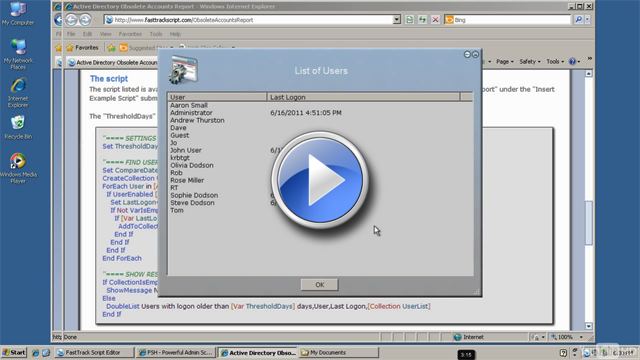 ShowMessage No active users have logon older than [Var ThresholdDays] days. The above script can easily be re-written to list obsolete computer accounts instead. All the same attributes that exist on user accounts also exist on computer accounts. This means that the script can be modified to list computers instead of users simply by replacing the Active Directory user functionality with the equivalent functionality for Active Directory computers, as listed below. This script is also available directly in the script editor: Go to the "Documentation" tab, select "Obsolete Computer Accounts Report" under the "Insert Example Script" submenu. When the script is visible in the editor, simply press F5 to execute it. ShowMessage No active computers have logon older than [Var ThresholdDays] days. To compile your script into a single executable custom application, open the script and go to the "Create Exe File" menu and select the "Save Script As Exe File" menu item - or press F10. Your script is now compiled into a single executable file. Remember to save a copy of the script, as the executable file cannot be reverse engineered into the original script. Please refer to this page for more information on pros and cons of custom applications versus executing the original script. Watch Senior Technical Writer Steve Dodson from Binary Research International walk you through the material presented on this page. Want to terminate local admin rights? "Use this as a replacement for VBScript and PowerShell"
"It's easy to include attractive GUI elements in FastTrack scripts, beyond the basic dialog boxes and text input that VBScript offers ... Another powerful feature is the ability to distribute scripts as Windows Installer (.msi) or standard .exe files. Although interesting in its own right, this ability results in a much more intriguing capability: to repackage -- or wrap -- software installers as .msi files without using snapshots. If you've ever created an .msi installer file from before-and-after system snapshots, for use with a software distribution system such as Group Policy or SCCM, then you know how hit-and-miss the results can be." "We found the FastTrack syntax to be more transparent and easier to learn than Microsoft's PowerShell – the editor in particular provided good support in this regard. the Script Editor offers a large number of options from the command set through to simple output of graphical elements, which cannot be achieved at all with PowerShell or other solutions or only with a significantly greater level of effort." "Anyone wanting to tackle the many hurdles in everyday admin and especially anyone for whom logon scripts and client automation is a priority will benefit from the variety of functions offered by FastTrack."